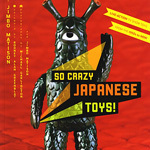 Marka27, Frank Kozik, So Crazy Japanese Toys! Finally thereâ€™s an accessory for all your vinyl related Mayan rituals. Enter Marka27â€™s 16â€ Mini-God speakers. They run on a 9v battery via a built-in 1.5mm audio jack, speaker sounds emerge from the belly of the beasts. 800 units will be available at the San Diego Comic-con and more available at Toy Tokyo. 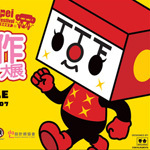 The Taipei Toy Festival is soon approaching (July 5-8, 2007). If for some reason you happen to be in Hong Kong or Taiwan proper, do not, repeat, do not, miss this chance at any costs. It may not be the biggest festival out there but it is probably your only chance to personally meet some of the greatest creative minds in the industry. Last years festival was attended by Touma, Mori Chak, Frank Kozik and many many more, This year, you can expect custom giveaways from the likes of CI Boys, Gooki, Smery and Reni x Monster Taipei. Expect ample servings of Stinky Tofu as well. 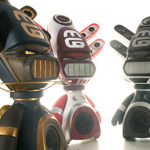 Play Imaginativeâ€™s silicon chip style Dekobkoâ€™s are back, this time with Japanese designs by Devil Robots and Furi Furi. Two special versions, along with the original, are kicking off the re-release of the series. Look for the Camo Grunge and robotic Orange Bone Dekosuke colourways Like the previous ones, these guys connect at the head with articulated arms and legs. After smorkin labbits, mongerforces and the sho-po-plop, Frank Kozikâ€™s smorkin series goes international and political, watermelon style. The lopsided smorkers dubbed â€˜Jakesâ€™ feature Chairman Mao melon, anarchisto melon, Kamikazes shark melon, James Dean melon and the original classic, water melon melon. 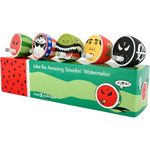 The 1.5 high melon set comes in a watermelon cigarette shaped box, designed by Kozik himself. Cigarette fetishists need apply. This book is dated a few years back but itâ€™s got an awesome collection of super high-glossy photos documenting old school Japanese monster figures or, kaiju, from the 50â€™s to the 70â€™s that are now being recreated by artists like Secret Base, Gargamel and RealxHead. Itâ€™s a wicked trip down memory lane and maybe a point of reference for any customizers or designers out there looking for some inspiration. Standout pieces from the book include the flame beast Kitty Fire from Mirror Man (1971), Kanegon from Ultra Q (1966), and the golden skulled Ohgon Bat, hero of the Ohgon Bat series (1966). Written by Jimbo Matison with photos by Michael Garlington. Great job. I wish I was in Taipei. One day…. Dude I think the website needs more whitespace. Too many graphics. My mental space feels cluttered. Big up Marka27! i need me some of those mini gods! word….congrats man!